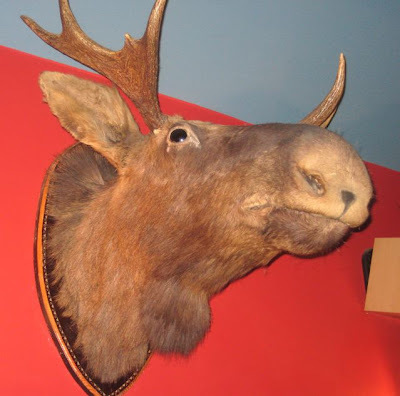 If you hunger for moose in Prague, your options are limited. 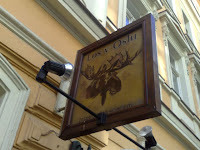 In fact, there may be only one: Los v Oslu (The Moose in Oslo). There you will find a moose. But it's not the eatin' kind. It's just for lookin'. We've been to the restaurant a couple of times. It's not far from where we live. Our first visit was many months ago during summer. We sat outside. The kitchen offered a few Norwegian items in keeping with the name, but on the whole, the menu was all over the map. V started with escargots (145 CZK). 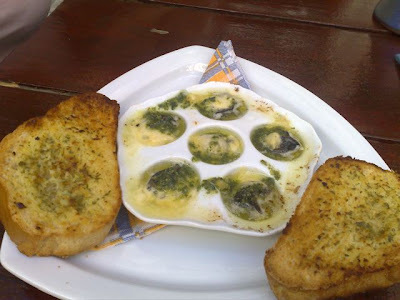 The six plump snails came with plenty of garlic butter, and garlic toast on the side. Less usual was the melted cheese on top. 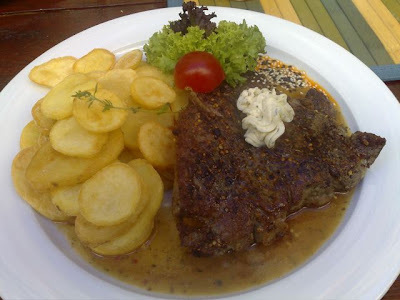 V said they were reasonably good, but not quite as good as Cafe Savoy's, which go for 185 CZK. 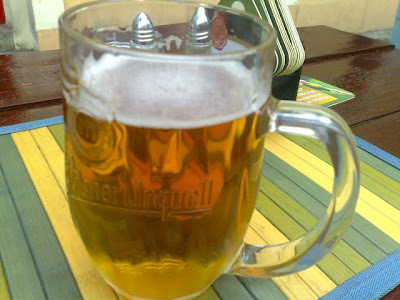 I had a Pilsner Urquell on tap. 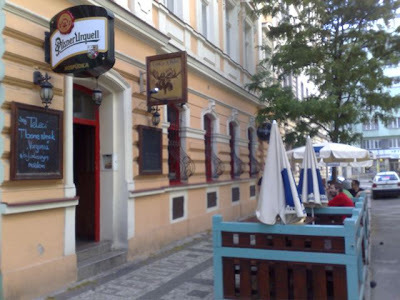 On our second, more recent visit, they had draft Staropramen (.5 liter/28 CZK), Stella Artois (.5 liter/38 CZK), and Hoegaarden (.5 liter/40 CZK). No Pilsner Urquell, no Gambrinus. A major beer downgrade, gosh darn it! For a main course, I had the Uruguayan rib eye steak with South American spices (325 CZK) and a side of "dollar" fries (38 CZK). I asked for the steak medium rare. We heard the waitress yell "medium rare!" to the kitchen. After a long wait, it came out. Well done. The good quality beef was still tender. This indicated to me that is probably was Uruguayan and not Czech, but the spices didn't taste like South America to me. I liked it, but itwould have been better if cooked as ordered. The juices underneath made the potatoes soggy. 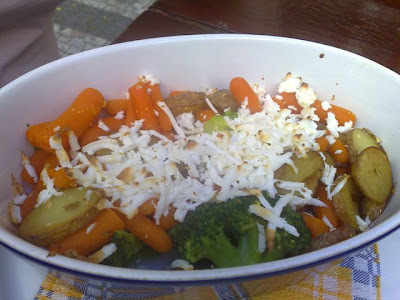 V ordered the Balkan potatoes with bechamel sauce, vegetables, and cheese (125 CZK). She liked it -- good price, pretty tasty, and healthy. So, she was disappointed many months later when she returned and ordered it again. 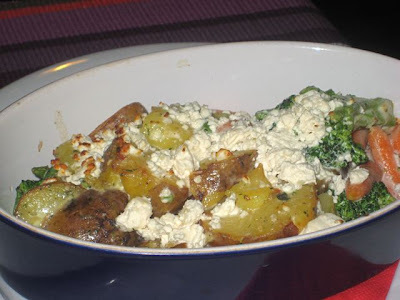 This time, there were more potatoes, less carrots, too much salty cheese, and over-cooked broccoli that was falling apart. An inconsistent kitchen? You betcha! 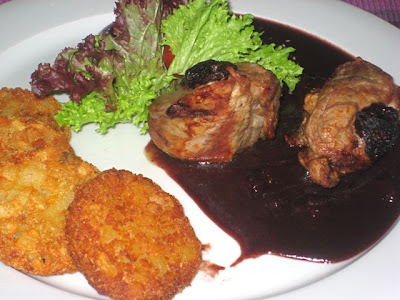 On my second visit, I had the pork loin stuffed with dried plums, covered with plum sauce (195 CZK). The pork was overcooked, very dry, and tough. The plums were way too sweet. I wouldn't get it again. However, I did like the crispy fried potato roti (38 CZK). They were similar to McDonald's hashbrowns, but with a lot more flavor. There was also a Belgian beer club in the basement, and I saw they had a multitude of exotic brews from the Brabant on offer. I wanted to go down to check it out, but it was not happening that night. The lights were out. It was a shame Los v Oslu had so many problems -- dried-out, tough meat, mushy veggies, and lousy beer. But what do you expect when you pal around with a bunch of Norwegian wannabes? 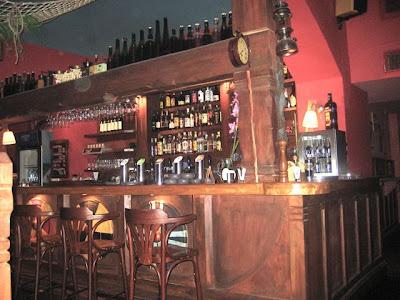 Given its convenient location, there is always the temptation to pop in for a bite on the way home. But that would be wrong. A violation of all the good dining values that I stand for. So, if I am ever behaving like a beast and compromising my culinary principles for the sake of expedience, perhaps some good lady will do the right thing. Had dinner here recently for the first time. Had the rib-eye. It was NOT good. My dining companion (who also loves steak) and I left over 90% of it. Very very rubbery. Very nice french fries (NOT included with the steak BTW). However, my friend had the [pork] goulash (185 kcs) which was fantastic. Yeah yeah, it comes in a kitschy breadloaf [? ], but it really was exceptionally tasty and the pork pieces were as nice and tender as the rib-eye should have been. Spicy too. There was so much that even between two of us, we weren't able to finish the whole loaf after having shared the goulash. The service was very friendly (they even asked why we had left so much steak, though they didn't offer to do anything about it [295 kcs!]). But I'll go back for that goulash. My first and (maybe, I´m not quite sure) last visit: the service was very good, the wine was good, but I asked for raw steak - it was completely welldone and after returning this horrible stuff I've got medium (which I ate - I was sooo hungry)... A lot of smokers and no fresh air.